There is one spiritual accomplishment that prevails over all the others…and that is the attainment of happiness. How fortunate we in the US are to have this great teacher and healer here to learn from directly. Oh what a Shifu! Robert is unusual. He has a deep well of knowledge from his many years of daily study with master Xiao Yao in China starting at the young age of eight. His thoughts, actions and communication radiate with great clarity and simplicity. He is a superb teacher. As a healer he is magnificent. I was stunned the first time I experience the crackling powerful healing currents that come from his hands as he works. His transformative 100 days fasting in the darkness of an underground cave was part of the journey that shaped his great ability. And the best part is that this teacher-healer is sweet, kind, loving, child-like without any taint of egotism. I encourage everyone to learn from Robert Peng through workshops, study, internet newsletters and his book and future works. 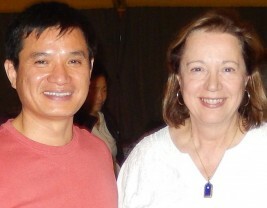 I has been my great privilege to have trained in QiGong healing with Master Peng and to continue to be a student. I share Master Peng’s methods with clients I use and teach Peng’s profound, yet simple ways of using energy when I work with clients helping them to overcome deep difficulties and move toward wellness, self mastery and longevity. Spirituality and Health Magazine named Peng one of the TOP 10 Spiritual Heroes of 2013.